Despite sleepwalking through much of the first half in San Jose, Nicolas Lodeiro brought the Sounders to life with a late goal to help them stay playoff-relevant. 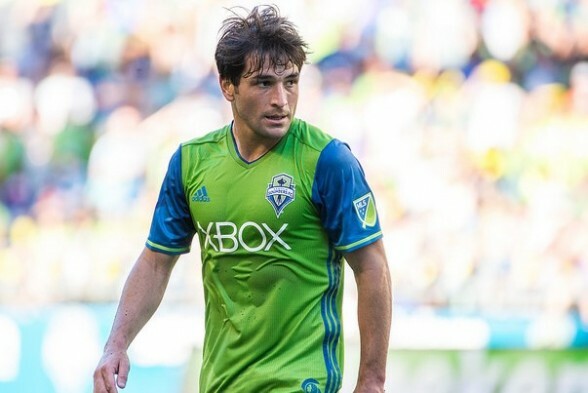 Put midfielder Nicolas Lodeiro on a list with Al Capone, D.B. Cooper and Jesse James. The Uruguayan pulled off a heist of his own invention against the San Jose Earthquakes at Avaya Stadium Saturday night, scoring in the 80th minute for a 1-1 draw to steal a point on the road for the Sounders. Lodeiro’s free-kick effort was Seattle’s only shot on goal. A lower back injury left captain Brad Evans unavailable, making room for center back Román Torres to make his first start for the Sounders since he tore his ACL at Avaya Stadium last year. Clint Dempsey, still undergoing evaluation for an irregular heartbeat, stayed in Seattle. Instead, Erik Friberg started as a defensive midfielder, pushing Cristian Roldan onto the right wing opposite Andreas Ivanschitz, with Lodeiro in the middle. Ivanschitz said that he thought a road point was a fair result. The 20-minute delay, reminiscent of the team’s 45-minute nap at the start of a 4-2 loss to Portland Aug. 28, may have been caused by the international break. With four starters returning from international duty, Seattle (9-13-5) looked like it was shaking off the cobwebs from its 12-day break in the time leading up to San Jose’s goal. San Jose (7-8-12) took advantage of a Seattle’s drowsiness in the 20th minute, when Seattle right back Tyrone Mears whiffed on a clearance of a long ball, and Jordan Stewart chased it into the left alley. Stewart sent a cross on the ground straight to Chris Wondolowski, who easily converted his 10th goal of the season. Seattle scoured its arsenal for something to throw at the dominant Earthquakes, but could only offer another whiff from Mears, this one off-target, as its lone shot of the half. The Sounders remembered which direction to run in the locker room at halftime, and came out in the second frame ready to lean far too heavily on Lodeiro as they moved the ball upfield. The reigning MLS player of the month, however, was betrayed by his first touch, leaving him unable to pick the lock on San Jose’s defense. With time winding down, Lodeiro got his chance. A free kick was awarded after Victor Bernárdez ran through Jordan Morris, just wide of the penalty area and 23 yards from net. Lodeiro spun the ball towards the mass of bodies that surged toward the goal line. Osvaldo Alonso went vertical to become a clear target. Keeper David Bingham fixated on Alonso, who seemed prepared to head the ball. Instead, he ducked underneath the ball, allowing it to bounce behind him and past the keeper into the net, leaving the San Jose defenders shrugging in disbelief. The cash-in was Lodeiro’s third since his arrival, and his second consecutive goal to rescue a point late in the game. That Lodeiro managed the shot after taxing national team travel and an obvious below-par performance speaks volumes. Both teams missed chances in stoppage time. Former Sounder Chad Barrett smashed a failed clearance over the bar from eight yards out, while Morris broke free on the right side but sent his cross straight to Bingham as substitute forward Nelson Valdez made his run in the box. Interim head coach Brian Schmetzer was happy enough to not come away empty-handed. The draw helped the Sounders in the race for the postseason only by denying the Earthquakes three points. Both Vancouver and Portland, however, took three points over the weekend, leaving the Timbers in sixth place with 38 points, the Whitecaps seventh with 34, and San Jose with 33, one more than Seattle and 32 points. Seattle’s next game at home against Vancouver Saturday (1 p.m., JoeTV) will be one of the last chances to avoid missing the playoffs for the first time in franchise history. With three of the seven remaining games on the road, the Sounders will need to find a way to turn around its 2-8-4 record away from home to play beyond October. With Dempsey’s future uncertain, however, the Sounders run the risk of becoming over-reliant on their Uruguayan midfield mastermind. If Lodeiro’s bag of tricks runs out, the Sounders will be settling in for a long off-season. Lodeiro is the new Duece. He’s really stepped it up the past month. I’d hate to think where the club would be without him. After Lodeiro, my big takeaway was Torres’ fine play in central defense. He looks like his knee is holding up, and he helped shut down many Quake attacks. The Sounders certainly could have used his defensive calmness and stability this whole season.